Origin and Habitat: Known only in cultivation. Agave filifera var. compacta Trel. Brit. Cact. Succ. J. 10: 66. 1992 comb. & stat. 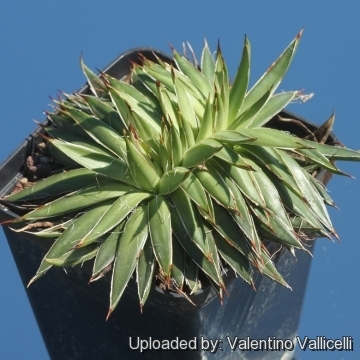 nov.
Agave filifera var. schidigera (Lem.) A.Terracc. Agave filifera var. adornata Scheidw. Agave schidigera var. angustifolia Lem. Agave schidigera var. ignescens Lem. Agave schidigera var. plumosa Lem. Agave filifera subs. schidigera f. compacta hort. Agave schidigera f. compacta hort. 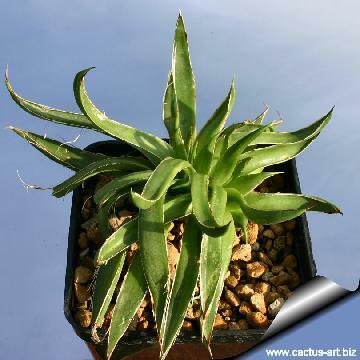 Description: Agave filifera (a.k.a. 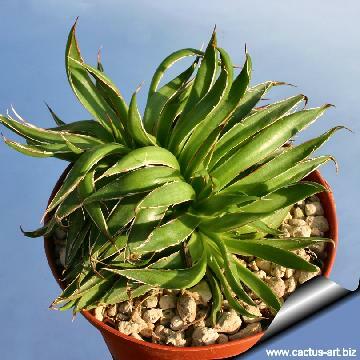 Thread-leaf Agave) is a small to medium sized agave that forms attractive rosette of leathery leaves each ending in a stout stiff spine. The leaves are dark green in colour with ornamental white threads along the edge. 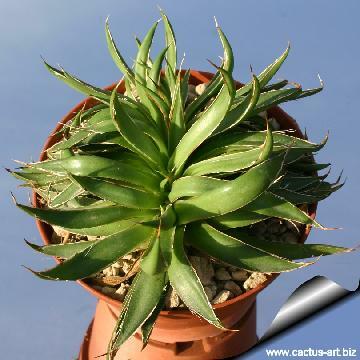 Crested form: The crested form Agave filifera f. cristata is an attractive dwarf plant and one of the few crested Agave known. Despite to its beauty it is still very rare and sought after by collectors, for its unique features. Leaves: Usually about 15 cm long and less than 2 cm wide, straight, lanceolate, long-tapering to the apex, narrowed towards the base, broadest in middle, convex above and below from base to mid-blade, stiff, spreading and somewhat upcurved, leathery, smooth, shiny dark green with bud-prints (white lines) on the surface. Margins pale, horny, splitting off as 3 or 5 long, thin threads. Terminal spine 1 cm, brown. Agave filifera Salm-Dyck: Forms tight rosettes of narrow, hairy, stiff dull-green leaves with very sharp terminal spines. Agave filifera f. cristata: This is one the very few known crested agaves, it forms a strange fan shaped, wavy rosette. Agave filifera subs. schidigera (Lem.) B.Ullrich: Small or medium sized plant that forms stemless rosette to 60 to 90. It is decorated with thin white curly marginal fibres spreading in all directions which sometimes are very dense. Agave filifera subs. schidigera f. compacta hort. : Very compact, small, symmetrical plant, growing to 20-30 cm wide and 20-25 cm tall. Leaves decorated with thin white curly marginal fibres and with very ornamental white bud imprints. Agave filifera subs. schidigera cv. Shira Ito No Hoi: Rosette is composed of dark green leaves, each highlighted by a creamy-white border and curly white hairs. Agave х leopoldii hort. ex G.Nicholson: Miniature hybrid species (A. filifera x A.filifera var. schidigiera) that has lots of fibres peeling off its short, very narrow leaves, and lots of suckers. Agave х leopoldii cv. Hammer Time: The leaves are slightly elongated with a golden stripe down their edges. 5) Breitung, A. J. (1962); "Cultivated and native Agaves in the South-western United States" (Part 19; Cact. Succ. J. (USA) 34(2): 42-45. 6) Breitung, A. J(1968): "The Agaves." Cact. Succ. J. (USA) Yearbook, Abbey Garden Press, Reseda. 7) Terraciano, A. 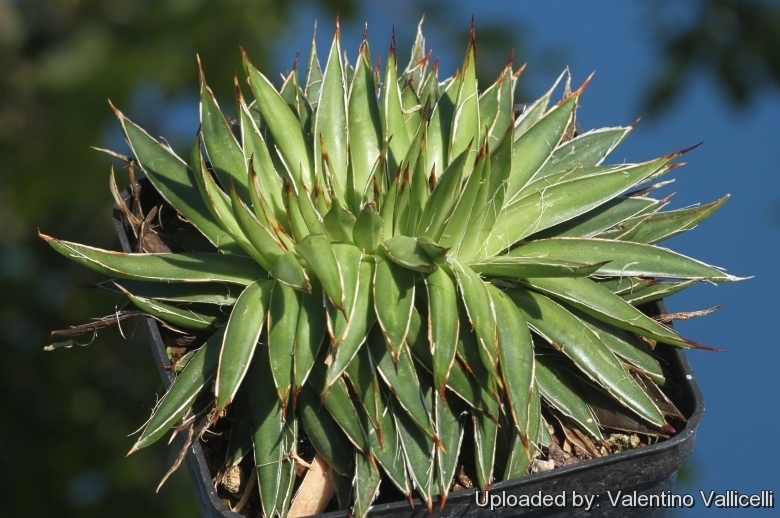 (1885): "Primo contributo ad una monografia delle Agave." Stabil. Tipogr. Barnaba Cons di Antonio, Napoli. Cultivation and Propagation: It is a stunning specimen plant for containers or a well drained spot in the garden. It tend to be slow grower, but worth the effort. Soil: Grow it in porous soil with adequate drainage. Sun exposure: It do well in full sun or a lightly shaded area. Moisture: Water thoroughly when soil is dry to the touch. In winter watering this plant can be done once every 1-2 months, there is no need to mist the leaves. Hardiness: It is theoretically hardy to -3° C, particularly when dry but it is best to avoid severe freezing temperatures. Uses: These striking plants are wonderful when used for accent or simply to provide some all year round foliage colour and often used in a pot as a patio plant, they make an eye-catching statement and along with other evergreen plants in pots, can be moved around to change the scenery or position to give more shelter.Uses: These striking plants are wonderful when used for accent or simply to provide some all year round foliage colour and often used in a pot as a patio plant, they make an eye-catching statement and along with other evergreen plants in pots, can be moved around to change the scenery or position to give more shelter. Propagation: Relatively easy to propagate by seeds or by suckers (if available) Remove the basal suckers in spring or summer and let the cuttings dry for a few days before inserting in compost.. only problem is the logistics of getting to the suckers - very sharp spines and suckers usually right up against, or underneath the mother plant.